SPYDER EXTRAS PREMIUM TIRE SEALER & BALANCER: TIRES WILL ALWAYS BE BALANCED! 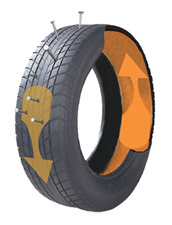 SPYDER FRONT TIRES USE 12 OZ. SPYDER REAR TIRE USE 16 OZ. 16-oz. 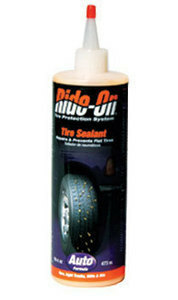 bottle of Ride-On TPS tire sealant (tyre sealant) for your Spyder. Iinstallation, valve core removal tool, and installation hose. Each bottle contains enough Ride-On to treat an average small to medium car tire. Please refer to our dosage table for exact dosages required for your tire size. The dosages shown on the bottle label represent more than 80% of the most common tire sizes in use today. You can view our complete dosage table by visiting our website www.ride-on.com.